We’re always pumped when the Hideout BMX crew drop a new video. Here’s their latest masterpiece featuring Robbo, Chris Jenner, Mikey Palmer, Gaz Docker and Joe Whitmore spending two days cruising spots in the Midlands! This video is PACKED full of style and the film work is great as always. This is one BMX video you won’t want to miss! Normally we get to watch Robbo cruising through the woods with some amazing style. However, for his new Kore Store video, he has some jibs out on the streets for you to check out! The amazing style came with him.. Don’t worry! Check it! We spotted this sneak peek over on Can You Dig It! It looks like Mutiny Bikes have just released a limited edition run of camouflage Villij frames that are hitting distributors worldwide now. 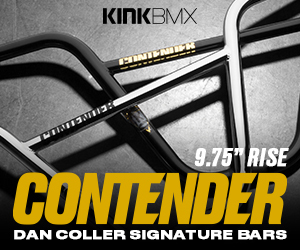 This limited edition frame comes in top tube lengths of 20.75″, 21″ and 21.25″ and will come with a retail price of $320! The Tom “Robbo” Robinson signature Villij frame is made from 100% 4130 Sanko chromoly tubing with a 74-degree head tube angle, 71-degree seat tube angle, 11.8″ bottom bracket height, 8.6″ stand over height and 13.6″ chain stay length (Slammed). The frame has a gusset on the down tube, an integrated seat post clamp, bullet end seat and chain stays, plenty of room for a 2.40″ tire and welded chain stay brake mounts! View more photos right here. Head over to the Mutiny Bikes website for a fresh interview with Tom “Robbo” Robinson about trails and trail building. Definitely a good read! Here’s another one we’ve been waiting all week for! Mutiny just dropped this video of Matt Roe and Tom “Robbo” Robinson getting down at Asylum skatepark! STYLE FOR MILES! “Roey and Robbo enjoy a private session at the new Asylum Park in the UK.